Dry mix method and wet mix method belong to two recognized methods of shotcrete construction which are dependent on the time in which the water is included to the mortar or concrete mix. Dry Mix Shotcrete Process: According to American Concrete Institute (ACI), Dry mix shotcrete means ” the shotcrete in which most of the mixing water is included at the nozzle. Dry Mix Shotcrete Method: The dry mix method is based on mixing the cement and wet aggregates at desired ratio prior to deliver it to the shotcreting device. The constituents blended perfectly are then arranged on the device hopper. All through the shotcreting operation, the mix is transferred from the hopper to the nozzle via the delivery hose of the equipment by applying compressed air. As soon as the dry mix moves to the nozzle, water under high pressure is sprinkled to the mix via a perforated ring affixed to the equipment. Due to this, the dry mix becomes wet with water. In this way, the desired wet concrete or mortar mix is jetted at a greater velocity on the surface to be shotcreted. The nozzleman or placing operator manage the amount of water for the dry mix shotcrete method through a valve existed in the device. The dry mix shotcrete is utilized in areas where fewer placements are necessary and no or limited vehicle are available. 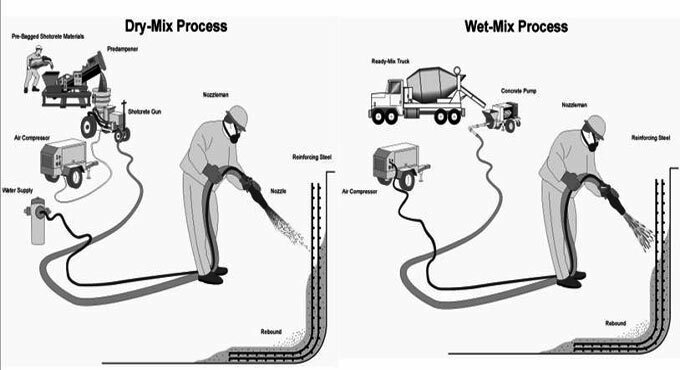 Wet Mix Shotcrete: The wet mix method is based on mixing all the constituents to develop mortar or concrete with required water content. Here, the mix to be shotcreted is set prior to put it in the shotcreting equipment. The delivery equipment applied is either a positive displacement type or a pneumatic -feed. Wet Mix Shotcrete Principle: The method is based on driving the wet mix to the nozzle via the delivery hose with the help of compressed air. The mix is then shot at high velocity on the surface to be shotcreted.